KRABI: National Park officials yesterday erected signs warning visitors of venomous jellyfish at Koh Hong, Koh Lao Lading and Koh Pak Bia after thousands of purple-colored jellies appeared in the water off the islands in Krabi. “The signs are in English and Thai. 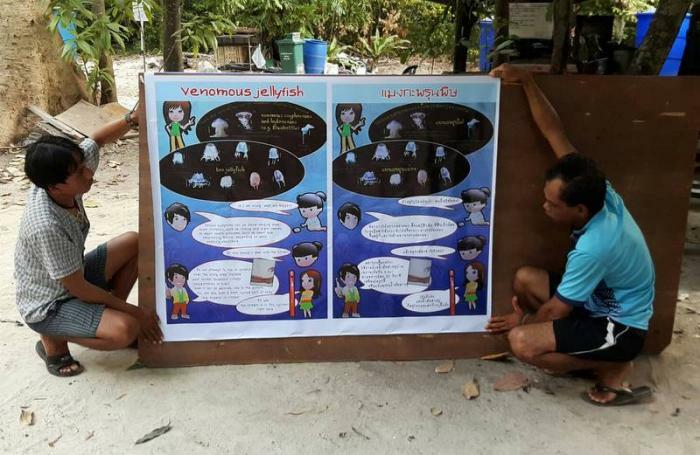 They have been put up to warn the public about the venomous jellyfish,” said Jampen Pormpakdee, chief of the Koh Hong protection zone of Than Bok Khorani National Park. “We are clearing the dead jellyfish from the water and on the beaches. They are a few centimeters long, and known locally as ‘fire jellyfish’. They are venomous, causing irritation and pain if touched,” he said. Officers believe the jellyfish have been washed toward the shores due to a change in wind direction. “There are no jellyfish inside the lagoon, so tourists can swim there if they want,” Mr Jampen said.